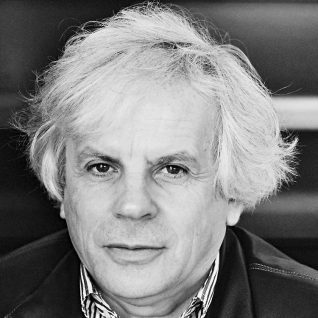 A professor of philosophy, Pascal Mercier was born in 1944 in Bern, Switzerland. He is the author of Perlmann’s Silence and Night Train to Lisbon. He currently lives in Berlin. 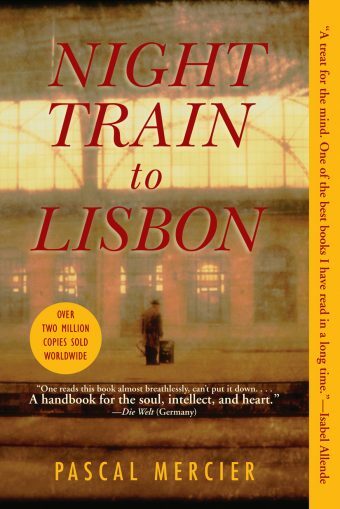 A huge international best seller, Night Train to Lisbon was published in hardcover in January with a modest first printing. 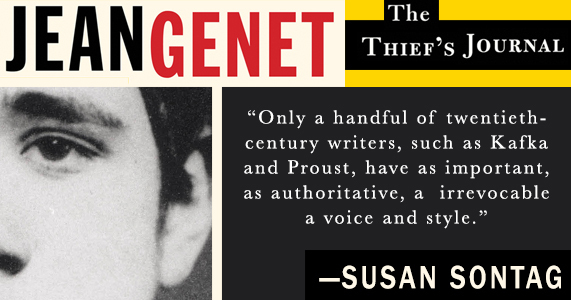 It has been hailed by booksellers and critics, and embraced by readers. Raimund Gregorius teaches classical languages at a Swiss lyc”e, and lives a life governed by routine. 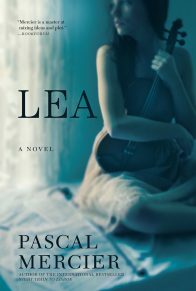 One day, a chance encounter with an enigmatic Portuguese woman inspires him to question his life—and leads him to an extraordinary book that will open the possibility of changing his existence. He takes the train to Lisbon that same night, and with him the words of Amadeu de Prado, a doctor whose practice and principles led him into confrontation with Salazar’s dictatorship, and a man whose intelligence and magnetism left a mark on everyone who met him. As Gregorius becomes fascinated with unlocking the mystery of who Prado was—meeting, among others, Prado’s eighty-year-old sister, who keeps the man’s house like a museum, an elderly torture survivor now confined to a nursing home, and Prado’s childhood friend and eventual partner in the resistance movement—an extraordinary tale takes shape, centered on a group of people working in utmost secrecy to fight dictatorship, and the betrayals that threaten to expose them. A haunting tale of repression, resistance, and the universal human struggle to connect, Night Train to Lisbon is richly layered, wonderfully told, and inexorably propelled by the mystery at its heart. 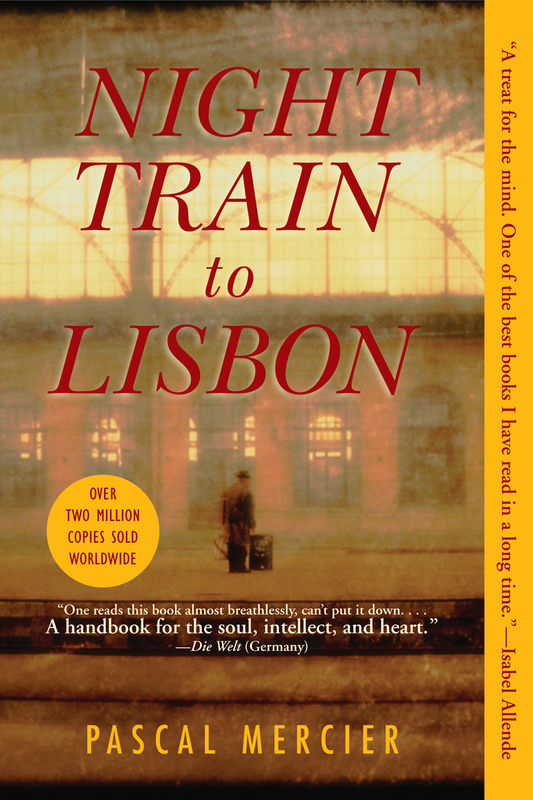 Recalling Bernhard Schlink and Nicole Krauss in its affirmation of the power of literature, will, and the individual, Night Train to Lisbon is a book of sensual beauty and artistic excellence, one that will be remembered for its soul and wit as well as its universality and great intellectual depth. The day that ended with everything different in the life of Raimund Gregorius began like countless other days. At quarter to eight, he came from Bundesterrasse and stepped onto the Kirchenfeldbrücke leading from the heart of the city to the Gymnasium. He did that every workday of the school term always at quarter to eight. Once when the bridge was blocked, he made a mistake in beginning Greek class afterward. That had never happened before nor did it ever happen again. For days, the whole school talked of nothing but this mistake. The longer the discussion lasted, the more it was thought to be a mistake in hearing. At last, this conviction won out even among the students who had been there. It was simply inconceivable that Mundus, as everyone called him, could make a mistake in Greek, Latin or Hebrew. Gregorius looked ahead at the pointed towers of the Historical Museum of the City of Bern, up to the Gurten and down to the Aare with its glacier green water. A gusty wind drove low-lying clouds over him, turned his umbrella inside out and whipped the rain in his face. Now he noticed the woman in the middle of the bridge. She had leaned her elbows on the railing and was reading in the pouring rain what looked like a letter. She must have been holding the sheet with both hands. As Gregorius came closer, she suddenly crumpled the paper, kneaded it into a ball and threw the ball into space with a violent movement. Instinctively, Gregorius had walked faster and was now only a few steps away from her. He saw the rage in her pale, rain-wet face. It wasn’t a rage that could be dumped into words and then blow over. It was a grim rage turned inward that must have been smoldering in her for a long time. Now the woman leaned on the railing with outstretched arms, and her heels slipped out of her shoes. Now she jumps. Gregorius left the umbrella to a gust of wind that drove it over the railing, threw his briefcase full of school notebooks to the ground and uttered a string of curses that weren’t part of his usual vocabulary. The briefcase opened up and the notebooks slid onto the wet pavement. The woman turned around. For a few moments, she watched unmoving as the notebooks darkened with the water. Then she pulled a felt-tipped pen from her coat pocket, took two steps, leaned down to Gregorius and wrote a line of numbers on his forehead. Now she looked at her hands as if she were seeing them for the first time. The rain on the thick eyeglasses muddied Gregorius’s sight, and he groped awkwardly for the wet notebooks. The tip of the felt pen seemed to slide over his forehead again. But then he realized it was now the fingers of the woman, who was trying to wipe away the numbers with a handkerchief. “It is out of line, I know . . .” And now she started helping Gregorius gather up the notebooks. He touched her hand and grazed her knee, and when the two of them reached for the last notebook, they bumped heads. Absently, looking down, she shook her head. The rain beat down on her hair and ran over her face. “Ah . . . yes, of course,” Gregorius stammered. Silently they walked together to the end of the bridge and on toward the school. The sense of time told Gregorius that it was after eight and the first hour had already begun. How far was “a few steps”? The woman had adjusted to his pace and plodded along beside him as if she would go on like that all day. She had pulled the wide collar of her coat so high that, from the side, Gregorius saw only her forehead. “Can I come along?” she asked softly. Gregorius hesitated and ran his sleeve over his wet glasses. “In any case, it’s dry there,” he said at last. She went up the stairs, Gregorius held the door open for her, and then they stood in the hall, which seemed especially empty and quiet now that classes had started. Her coat was dripping. “Wait here,” said Gregorius and went to the bathroom to get a towel. At the mirror, he dried the glasses and wiped off his face. The numbers could still be seen on his forehead. He held a corner of the towel under the warm water and wanted to start rubbing when he stopped in the middle of the movement. That was the moment that decided everything, he thought when he recalled the event hours later. That is, all of a sudden, he realized that he really didn’t want to wipe away the trace of his encounter with the enigmatic woman. He imagined appearing before the class afterward with a phone number on his face, he, Mundus, the most reliable and predictable person in this building and probably in the whole history of the school, working here for more than thirty years, impeccable in his profession, a pillar of the institution, a little boring perhaps, but respected and even feared in the university for his astounding knowledge of ancient languages, mocked lovingly by his students who put him to the test every year by calling him in the middle of the night and asking about the conjecture for a remote passage in an ancient text, only to get every time off the top of his head information that was both dry and exhaustive, including a critical commentary with other possible meanings, all of it presented perfectly and calmly without a soup . . . on of anger at the disturbance—Mundus, a man with an impossibly old-fashioned, even archaic first name you simply had to abbreviate, and couldn’t abbreviate any other way, an abbreviation that revealed the character of this man as no other word could have, for what he carried around in him as a philologist was in fact no less than a whole world, or rather several whole worlds, since along with those Latin and Greek passages, his head also held the Hebrew that had amazed several Old Testament scholars. If you want to see a true scholar, the Rector would say when he introduced him to a new class, here he is. And this scholar, Gregorius thought now, this dry man who seemed to some to consist only of dead words, and who was spitefully called the Papyrus by colleagues who envied him his popularity—this scholar would enter the room with a telephone number painted on his forehead by a desperate woman apparently torn between rage and love, a woman in a red leather coat with a fabulously soft, southern voice, that sounded like an endless hesitant drawl that drew you in merely by hearing it. Later, Gregorius couldn’t believe he had really said that; but he must have, for all at once they walked to the classroom next to each other; he heard the screech of his rubber soles on the linoleum and the clack of the boots when the woman put her foot down. “What’s your mother tongue?” he had asked her just now. The o she pronounced surprisingly as a u, the rising, strangely constrained lightness of the ê and the soft sh at the end came together in a melody that sounded much longer than it really was, and that he could have listened to all day long. His hand was on the doorknob when he asked her to say the word once more. She repeated it, and for the first time he saw her smile. The chatter broke off abruptly when they entered the classroom. A silence of one single amazement filled the room. 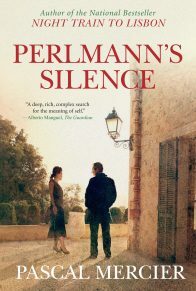 Later, Gregorius remembered precisely: He had enjoyed this surprised silence, this speechless incredulity, that spoke from every single face, and he had also enjoyed his delight at being able to feel in a way he would never have believed possible. What’s up now? The question spoke from every single one of the twenty looks that fell on the peculiar couple at the door, on Mundus, standing with a wet bald head and a rain-darkened coat next to a hastily combed woman with a pale face. “Perhaps there?” said Gregorius to the woman and pointed to the empty chair in the back corner. Then he advanced, greeted them as usual, and sat down behind the desk. He had no idea how he could have explained, and so he simply had them translate the text they were working on. The translations were halting, and he caught some curious looks. There were also bewildered looks for he—he, Mundus, who recognized every error even in his sleep—was overlooking dozens of errors, half measures, and awkwardness. He managed not to look over at the woman. Yet, every second he saw her, saw the damp strands stroking her face, the white hands clenched, the absent, lost look going out the window. Once she took out the pen and wrote the phone number on the notebook page. Then she leaned back again and hardly seemed to know where she was. It was an impossible situation and Gregorius glanced at the clock: ten more minutes until the break. Then the woman got up and walked softly to the door. When she got there, she turned around to him and put her finger on her lips. He nodded and she repeated the gesture with a smile. Then the door fell shut with a soft click. From this moment on, Gregorius no longer heard anything the students said. It was as if he were all alone and enclosed in a numbing silence. At some time he stood at the window and watched the red female figure until she had disappeared around the corner. He felt the effort not to run after her reverberate in him. He kept seeing the finger on her lips that could mean so many things: I don’t want to disturb, and It’s our secret, but also, Let me go now, this can’t go on. When the bell rang for the break, he stood still at the window. Behind him, the students left more quietly than usual. Later he went out too, left the building through the back door and sat down across the street in the public library, where nobody would look for him. For the second part of the double class, he was on time as always. He had rubbed the numbers off his forehead, written them down in the notebook after a minute of hesitation and then dried the narrow fringe of gray hair. Only the damp spots on his jacket and pants still revealed that there had been something unusual. Now he took the stack of soaked notebooks out of his briefcase. That was how they knew him and an audible sigh of relief went through the room. Now and then, he still caught a curious look, and a remnant of shyness was in a few voices. Otherwise, everything was as before. He wrote the most frequent errors on the board. Then he let the students work silently on their own. Could what happened to him in the next quarter hour be called a decision? Later, Gregorius was to keep asking the question and never was he sure. But if it wasn’t a decision—what was it? It began when he suddenly looked at the students bending over their notebooks as if he were seeing them for the first time. Lucien von Graffenried, who had secretly moved a piece in the annual chess tournament in the auditorium, where Gregorius had played simultaneous matches against a dozen students. After the moves on the other boards, Gregorius had stood before him again. He noticed it immediately. He looked at him calmly. Lucien’s face flamed red. “That’s beneath you,” said Gregorius and then made sure this game ended in a draw. Beatrice Lüscher with the regular, precise handwriting who had grown old frighteningly fast under the burden of her always perfect achievements. René Zingg, always at the lowest end of the scale. And naturally, Natalie Rubin. A girl who was stingy with her favor, a bit like a courtly maiden of the past, reserved, idolized and feared for her sharp tongue. Last week, after the bell rang for the break, she had stood up, stretched like someone at ease in her own body, and taken a piece of candy out of her shirt pocket. On the way to the door, she unwrapped it and when she passed him, she put it to her mouth. It had just touched her lips when she broke off the movement, turned to him, held the bright red candy to him and asked: “Want it?” Amused at his astonishment, she had laughed her strange light laugh and made sure her hand touched his. Gregorius went through them all. At first he seemed to be only drawing up an interim balance sheet of his feelings for them. Then, in the middle of the rows of benches, he noticed that he was thinking more frequently: How much life they still have before them; how open their future still is; how much can still happen to them; how much they can still experience! Português. He heard the melody and saw the woman’s face as it had emerged with closed eyes behind the rubbing towel, white as alabaster. One last time, he slid his eyes over the heads of the students. Then he stood up slowly, went to the door where he took the damp coat off the hook, and disappeared, without turning around, from the room. His briefcase with the books that had accompanied him a lifetime remained behind on the desk. At the top of the steps, he paused and thought how he had taken the books to be rebound every couple of years, always to the same shop, where they laughed at the dog-eared, worn-out pages that felt almost like blotting paper. As long as the case lay on the desk, the students would assume he was coming back. But that wasn’t why he had left the books or why he now resisted the temptation to get them. If he left now, he also had to go away from those books. He felt that very clearly, even if at this moment, on the way out, he had no idea what it really meant: to go away. In the entrance hall, his look fell on the little puddle that had formed when the woman in the dripping coat had waited for him to come back from the bathroom. It was the trace of a visitor from another, faraway world, and Gregorius regarded it with a devotion usually reserved for archaeological finds. Only when he heard the janitor’s shuffling step did he tear himself away and hurry out of the building. Without turning around, he walked to the corner, where he could look back unseen. With a sudden force he wouldn’t have expected of himself, he felt how much he loved this building and everything it stood for and how much he would miss it. He checked the numbers again: Forty-two years ago, as a fifteen-year-old Gymnasium student, he had entered it for the first time, wavering between anticipation and apprehension. Four years later, he had left it with his diploma in hand, only to come back again four years later as a substitute for the Greek teacher who had been in an accident, the teacher who had once opened the ancient world to him. The student substitute turned into a permanent student substitute, who was thirty-three by the time he finally took his university exams. He had done that only because Florence, his wife, had urged him. He had never thought of a doctorate; if anyone asked him about it, he only laughed. Such things didn’t matter. What did matter was something quite simple: to know the ancient texts down to the last detail, to recognize every grammatical and stylistic detail and to know the history of every one of those expressions. In other words: to be good. That wasn’t modesty—his demands on himself were utterly immodest. Nor was it eccentricity or a warped kind of vanity. It had been, he sometimes thought later, a silent rage aimed at a pompous world, an unbending defiance against the world of show-offs who made his father suffer all his life because he had been only a museum guard. Others, who knew much less than he—ridiculously less, to tell the truth—had gotten degrees and solid positions: they seemed to belong to another, unbearably superficial world with standards he despised. In the school, no one would ever have come up with the idea of dismissing him and replacing him with somebody with a degree. The Rector, himself a philologist of ancient languages, knew how good Gregorius was—much better than he himself—and he knew that the students would have risen in revolt. When he finally did take the examination, it seemed absurdly simple to Gregorius, and he handed it in in half the time. He had always held it against Florence a bit that she had made him give up his defiance. Gregorius turned around and walked slowly toward Kirchenfeldbrücke. When the bridge came into view, he had the amazing feeling, both upsetting and liberating, that, at the age of fifty-seven, he was about to take his life into his own hands for the first time. 1. In the first chapter we meet Raimund Gregorius, aka Mundus, aka Papyrus and learn about his essential habits. Now that you have finished the book, as the story progressed, and in light of what you learned about him, throughout, how are his nicknames appropriate? “That was the moment that decided everything,” (p. 5). What do you think was decided? 2. After he leaves his classroom what makes Mundus head for the bookstore? Why does he have such an instinctive reaction to the book Um Ourives das Palavras by Amadeu Inácio de Almeida Prado? Cite some passages from A Goldsmith of Words to support your view. 3. Why did the woman on the bridge, strange as their interaction was, have such a lasting effect on Gregorius? What incident in Gregorius’s past makes the consequences less surprising? 4. 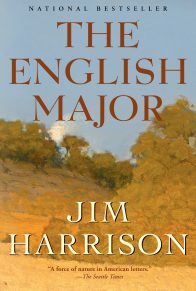 “That words could cause something in the world, make someone move or stop, laugh or cry: even as a child he had found it enigmatic and it had never stopped impressing him.” (p. 42). Why is this small piece essential to our understanding of the puzzle that is Gregorius? How is his métier, teaching ancient languages, involved with everything he thinks? What is the importance of books in the life of Gregorius and Prado? How do books connect the two? 5. In Lisbon Mundus has an accidental collision with a rollerblader. Are there other fortuitous “collisions”? Because his glasses were broken by the rollerblader, he gets new lenses prescribed by Mariana Eça. “With the new glasses the world was bigger and for the first time, space really had three dimensions where things could extend unhindered.” (p. 88). Discuss Gregorius and his eyesight. Concern with his vision has led him to some very important links. Connect some of these links to make a chain encircling Amadeu Prado. What other physical changes besides new glasses does Gregorius make? Discuss chance vs. choice. 6. Mundus interacts with three different physicians, Doxiades, his Greek doctor and friend in Bern, Eça, his Portuguese ophthalmologist, and of course, Amadeu Prado the man he encounters only through his writing. Why is a man of the mind drawn to medical practitioners concerned with the body? 7. Only six days pass between the moment that Gregorius leaves his old life in Bern to the moment when he first encounters Prado’s sister, Adriana, at the casa azul, “As if my whole future were behind this door,” (p. 97). In this short time he has become immersed in another man’s life, a life that was ended by an aneurysm thirty-one years before. How does time and memory have an effect on what he learns inside the house? 8. What is the nature of Adriana’s relationship with her brother, before and after his death? What are the important events that formed their bond? Why does she always wear the black ribbon around her neck? Is she a reliable source? 9. Mundus wishes to meet Mariana’s uncle João Eça because he knows that he had been in the resistance movement as had Prado. Mariana sets him up with an errand to deliver a recording of Schubert’s sonatas. Prado and Eça had first met on a train during Amadeu and Fatima’s honeymoon in England. Senhor Eça, as well as train journeys, in addition to the sonatas all take their place in the unraveling of some of the mysteries of Prado’s life. Is it all serendipity or is something else at work here? “Was he still Mundus, the myopic bookworm, who had gotten scared only because a few snowflakes had fallen in Bern?” (p.114). Was he? 10. Once trust is established between João Eça and Gregorius he learns a great deal from the older man. What part does the game of chess play in their relationship? In what other personal associations does chess figure? 11. Prado appears to have had a very different relationship with his sister Rita/Melodie than with his sister Adriana. After his wife, Fatima’s death, he writes a long letter to Melodie from Oxford in which he speaks of an Irishman with a red soccer ball. “No meeting of minds?” I asked. “What?” he shouted and howled with laughter. “What?” And then he shot the soccer ball he had been carrying the whole time onto the sidewalk. I would like to have been the Irishman, an Irishman, who dared to appear in All Souls College for the evening lecture with a bright red soccer ball.” (p. 137). What is Amadeu trying to communicate to his sister? Why does he want to be like the Irishman? How would his life have been different if he had been? 12. In order to find out more about Prado’s early days, Gregorius visits Father Bartolomeu, now in his nineties, who had been a teacher at the Liceu. Father Bartolomeu speaks of Prado’s funeral. “Two people, a man and a young woman, of restrained beauty came toward each other from each end of the path to the grave. Each had to cover an equally long way to the grave and they seemed to adapt the speed of their steps precisely to one another, so they arrived at the same time. Their eyes did not meet one single time on the way but were aimed toward the ground. To this day, I don’t know what kind of secret bound the two people or what it had to do with Amadeu” (p. 160). Who were these people and what was their secret, and what did it have to do with Prado? 13. Father Bartolomeu gives Gregorius an envelope containing Amadeu Prado’s “blasphemous” graduation speech. “I would not like to live in a world without cathedrals. I need the luster of their windows, their cool stillness, their imperious silence. I need the deluge of the organ and the sacred devotion of praying people” (p. 171). What does the speech reveal about Prado? Why was he sometimes called the “priest of truth”? 14. What does the note written by Prado about saving Mendes, “the doctor of death,” reveal? “Here what experience always kept teaching me is confirmed, quite against the original temperament of my thought: that the body is less corrupt than the mind” (p. 193). Does Prado think of himself primarily as a doctor? The question of sacrificing one life for many arises once again in the case of Estafânia Espinhosa. Do you think that there is a consistency between the two instances? What is ironic about Estâfania? Did you find Prado’s behavior inevitable? 15. Prado’s close friendship with Jorge O’Kelly, would be pianist, Lisbon pharmacist, former resistance fighter, and accomplished chess player, began when they were boys and flourished even though they differed in significant ways. In order to understand Prado, Gregorius must understand O’Kelly. In what ways were they different? What drew them to each other? “All the blood had drained out of his face. In this one single second, I realized that the most horrible thing had happened: our lifelong affection had turned into hate. That was the moment, the dreadful moment, when we lost each other” (p. 335). What split them apart? 16. Gregorius tracks down another close friend of Prado’s from his school days, Maria João Ávila. “If there was anybody who knew all his secrets, it was Maria Joao. In a certain sense, she, only she, knew who he was.” (p. 337). What does Gregorius perceive about her? How did this relationship develop? Was there any similarity to Prado’s other liaisons with women? 17. Gregorius eventually leaves his hotel in Lisbon to live in the apartment of a man, Senhor Da Silveira, whom he had met and befriended on the night train. What are the parallels in the friendship between these two and Prado/O’Kelly? What else has changed about Gregorius besides his address? What are the parallels between Raimundo Gregorius and Amadeu Prado? Cite some specific events in the narrative to sustain your views. 18. Many letters are quoted in this book. Gregorius reads one of these from the father, Judge Prado, to his son Amadeu and from the son, Doctor Prado to his father. 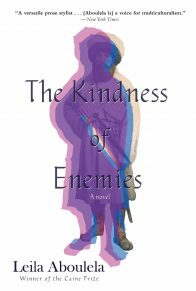 “It was crazy, thought Gregorius: both men, father and son, had lived on opposite hills of the city like opposing actors in an ancient drama, linked in an archaic fear of each other and in an affection they didn’t find the words for, and had written letters to each other that they didn’t trust themselves to send. 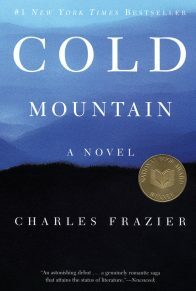 Clasped in muteness neither understood, and blind to the fact that one muteness produced the other.” (p. 291). What do the letters contain, and what is learned from them? What is the nature of the father-son relationship? 19. “And there’s something else about the intricate way you created me according to your will-like a wanton sculptress of an alien soul: the names you gave me Amadeu Inacio. Most people don’t think anything of it, now and then somebody says something about the melody. But I know better, for I have the sound of your voice in my ear, a sound full of conceited devotion. I was to be a genius. I was to possess godlike grace. And at the same time-the same time!-I was to embody the murderous rigidity of the holy Ignacio and his abilities to perform as a priestly general” (p. 312). What kind of a woman was Senhora Prado? What was the nature of the mother-son relationship? 20. “He had disappointed all expectations and broken all taboos, and that was his bliss. In the end, he was at peace with the bent judging father, the soft dictatorship of the ambitious mother, and the lifelong stifling gratitude of the sister.” (p. 379). Gregorius sees this image of Prado late in the story when he himself may be facing death. When the bookseller from the Spanish bookstore asks him if the book kept its promise, Gregorius says that it did, absolutely. How have the memories of the doctor/poet’s life helped him to bring together his own life and to find his own peace?